No one likes getting found out -- especially if you're a CEO working undercover to find out what it's really like to be a worker in your company. 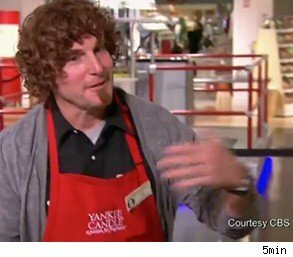 But when Harlan Kent, the president and CEO of the Yankee Candle Company, found his cover blown in "Undercover Boss" this week, it was an opportunity to demonstrate the kind of cool-headedness people want in a chief executive. The revelation marked the first such outing during the current season, the third for the CBS series. A similar incident occurred last season, according to the network. It's hard to know how the show was edited for this go-round, or whether producers may have stepped in to advise Kent. Was it really his instinct to pull aside a sales associate named Blaze and talk straight with him about his real identity? Or did producers coach Kent? In any event, during the opening segment of this past Friday's episode, Blaze immediately voiced his suspicions about the man whom claimed his name was Dan Johnson, an out-of-work chef appearing on a second chances reality show. "He seems too good at the situation," the bespectacled, rail-thin Blaze told the camera during his training session with "Dan." The pair were working at the wax hand station at the company's flagship store in South Deerfield, Mass. "He already knows what to do." Indeed, Kent did. Having spent 11 years working with the world's largest candle manufacturer, and the last 2½ as its chief executive, "Johnson" knew a thing or two about the business. It was a rare moment for the series -- that the chief executive isn't clueless as a field worker, and that he's found out as a result. The ease with with "Johnson" deftly guided customers through the recreational wax hand stand, showing them how to dip the candles and then add color, raised a red flag for Blaze. And this in spite of the Ronald McDonald-like disguise worn by Kent. And so Blaze confided to co-workers that he suspected this must be part of some "Undercover Boss" show. Seeing the suspicion grow among the employees forced Kent's hand, and he said he was uncomfortable not telling the truth. A bummer for Blaze, since he had just told "Dan" that sometimes he felt like "punching" the 8-year-olds at the store. Not quite the customer service strategy the CEO is hoping for. But whereas other bosses appearing on the series have blown up when confronted with lapses in customer service, Kent took Blaze aside and told him he'd like to spend more time with him. "This is very important to me," he said to his employee, even though at the top of the show, he'd told the camera that it would break his heart if his staffers were rude. Three other members of his 6,400-member staff, however, were exemplary workers. Jose, who works on the line at the company's plant in Whately, Mass., kept the company's image in mind while labeling candles. Customers don't expect or deserve to see crooked or misapplied labels after purchasing a store product, he said, and so he makes sure they are presentable. And he said he packages 7,000 to 8,000 candles a day. "Megan ... has taken ownership of the store," Kent said about his next trainer, the manager at a Yankee Candle store in Peachtree City, Ga. She was concerned about the store's appearance and even complained to corporate about cracks in the store's facade. No one responded. She also showed Kent how to maximize the space offered by the store by showing him how to properly arrange the candles. And Megan is happy as a manager to take part in the offering of coupons to customers outside the store. The shaggy-haired Dan, who works in retail at a Yankee Candle store in Center Valley, Pa., has an off-beat spunkiness that's pitch perfect for a boutique industry like candles. "Have a Yankee candle-rific day," Dan tells his customers after ringing them up. And so he was patient with "Dan Johnson" when the supposedly aspiring retail worker allowed a display to fall apart moments before the store's opening. For Kent, a self-described "type-A personality," this was exactly the opposite he was hoping for from his appearance on the show. "I was nervous about not being able to do the job," Kent said during an interview with AOL Jobs. "That's the number one thing. I didn't want to embarrass them and show that I was bad at things, that the CEO can't figure things out. I was really worried about being clumsy." While Kent displayed an uncommon dexterity handling the wax hands, he was nevertheless new to activities such as product stocking and bathroom cleaning. Such a division of labor, to be expected for a company that hauls in $730 million in annual revenue, is nevertheless a dramatic departure from the humble beginnings of the Yankee Candle Company. When 17-year-old Mike Kittredge couldn't afford to buy a candle for his mother back in 1969, he melted crayons to make it for her. From there, grew a candle empire now counting 552 stores. And such an environment is not fit for expletives, the Greenwich, Conn.- and Dartmouth-bred Kent instructed Blaze at the top of the reveal. "Drop it from everyday use" he told him after sitting down a for second tete-a-tete. Blaze goes on to note that he has grown up in a troubled house with an alcoholic father. Kent's reaction to this was similar to how he handled his cover being blown; he doubled down and said he'd like to take Blaze under his wing to move him to another job, which he'd find more exciting. It's an open question if he'd have been as magnanimous if CBS cameras weren't rolling. The rest of the reveal was easy. Jose, the label-expert, was given $5,000 to spend as he pleases, and another $10,000 for his boxing gym -- where he welcomes troubled youth. He was also told he's being tapped for a leadership role. Kent hoped the latter decision will change the image of the company characterized by Jose as home to a "kiss-up" mobility model. Megan, the coupon-offering manager, was told her store will be renovated, a move which elicited her applause. She also got an all-expense-paid trip for her family. And $20,000 for medical bills to help her get a better grip on her epilepsy, as well as access to top medical care. Dan, the greeter extraordinaire, got $10,000 for his student loans. And another $15,000 to help out his family, which will be especially appreciated given that his beloved father died last year of kidney failure. Hearing about that loss motivated Kent to proceed from his appearance on "Undercover Boss" to a fishing trip with his own father.